Description: The automata which are modeled in this application are composed of a set of spheres whose size and axis are relative to one another, and where each sphere is rolling upon the surface of one other sphere in a fully deterministic pattern in space and in time. The paths through space taken by one or more points within each sphere can also be visualized as the automaton carries out is choreographed movements. Description: This application is a laboratory for the creation of automata. An automaton is a system of circles (actually planar coordinate systems) moving relative to one another in a hierarchical fashion. That is, every circle in the system except one will be rolling along the circumference of one other circle at every moment in time. Automata are a superset of the mathematical curves called epicycloids and hypocycloids. Description: This application demonstrates the curious relationships wherein a tetrahedron can be inscribed in a cube in two different ways and a cube can be inscribed in a dodecahedron in 5 different ways. It also demonstrates a kind of quantum fluctuation or beating as a heart does, in which the tetrahedron oscillates back and forth between the two positions in which it can be inscribed in the cube, and in which the cube oscillates within the dodecahedron. 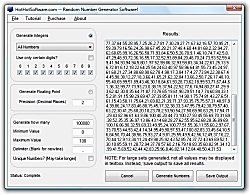 Description: Create unique random numbers, from random integers to random floats with this uniqur random number generation software. Description: One might wonder if there is a 3-dimensional golden-rectangular-solid that is analagous to the 2-dimensional golden-rectangle, which can be sub-divided recursively so that each left-over rectangular solid has the same proportions as the original rectangular solid. The 3D analogue to the 2D golden rectangle does indeed exist, and is depicted by this application. Description: Graph Digitizer Scout automatically converts hard-copy graphs, oscillograms, charts, plots, into X,Y. Different recognition methods including manual correction mode. Data can be exported to Excel, CSV format and other applications. Description: Math, financials, stats, combinative, dates, y=f(x), series, units and calendars conversions, geometry, pi, Fourier, Taylor, Gamma, Bessel, Bernoulli, Fisher, prime numbers, fractionations, equations, electricity, chemistry, molar masses, currencies. Divx Bitrate Calculator. Advanced astronomy and simulations 3d, physical and chemical Constants. Games: gravitation, billiards, calculations, tetris, quotations. Description: Alles ueber den kinderhochstuhl bei Ebay. Description: Universal tool for statistical analysis and modeling experimental and market data. Support import data from text and database files; paste; extraction from pictures. Statistical schemes cover all major statistical problems: building histograms including conditional; curve and surface fitting; multivariate approximation, near neighbors estimation; peaks revealing; scoring market data. Create instant report ready MS Word or HTML file.